After the Buccaneers were destroyed, 38-7 by the New Orleans Saints at home, the group that makes the decisions at 1 Buc Place had to make a change. The change they opted for was to remove Jim Bates as Defensive Coordinator and have current Head Coach, Raheem Morris, assume the role he was originally promoted to after Monte Kiffin’s departure. This move represented a pretty significant ideological and schematic change. Coach Bates tried to implement his 2 gap style defense with aggressive, man coverage and a set of blitz packages. If we are to believe what Coach Morris says, the plan was to have a hybrid of that new defensive scheme and a modified version of the defense previously known as the Tampa-2. Coach Morris expected to have significant impact on the scheme and the playcalling which was not the case. In an attempt to get the defense back on track and hopefully show enough improvement in Tampa to remain the Head Coach (not something Coach Morris admits to worrying about, but let’s be serious), Morris stepped in and Bates was relegated to the second coordinator relieved of duty by the franchise this year. Many people, from sportscasters to fans, rave about the Tampa-2. This base defense, which draws its foundation from Chuck Noll and Bud Carson’s implementation in Pittsburgh, gained popularity again once installed in Tampa by former coach Tony Dungy and Monte Kiffin. Like any scheme, changes are implemented real time. For simplicity sake, the two core concepts that you should remember is that the defensive line will hit their gap and try to establish a new line of scrimmage behind the ball rather than allowing the offensive line to engage them. This plays to the speed that the lineman in Tampa have had historically. In coverage, the Tampa-2 looks like a standard, 2 deep set. The difference is the action of the MLB (B. Ruud) who, at the snap, will backpedal and move back to cover a deep middle zone. (For a better and more detailed description of this defense, use Google or check out the decent Wikipedia entry). That all being said, that defense (like most) is simply one tool in the toolbox. Coach Morris (like Kiffin before him) does not simply set us in a Tampa-2 and watch the game play out. There are a plethora of adjustments from simple line alignments to blitzes and coverage modifications. Coach Morris has shown some 3-4 as well as some 5 man fronts. This is not unique. Good coaches always mix things up. They show something to the QB that looks simple (like a 2 deep shell) then bring the safety up and roll the coverage. This is some of the art that we were used to in Coach Kiffin. The question is, do we have another artist in Coach Morris? Well, statistically, the defense is improving. Coming into the first Atlanta game, the defense rated 27th overall (based on yards at 378.3), 32nd against the run (168.9) and 14th against the pass (209.4). After five games with Coach Morris calling the defense, the resultant numbers show improvement in every category. The defense is now 26th overall (with 363.5 yards per game allowed), 30th against the run (156.5) and 11th against the pass (206.9). Now those changes look very small. If the numbers for just the five games Coach Morris has been Defensive Coordinator for are evaluated, a different picture starts to surface. The more impressive statistic is in Points Allowed. Coming into the first Falcons game, the Bucs were 31st in the league allowing 29.4 points per game. That number has been moved down to 25.3 ppg now (for 27th in the league and, for the last five games under the new system, sits at 17.2 ppg for 6th in the league. Another way to look at defensive performance is via grading. The site Pro Football Focus (http://www.profootballfocus.com) grades out the performance of every player on every team for every game. This process goes on behind the walls of every training facility, but thanks to rabid fans, we have access to similar data. The performance of a player is dissected in every possible way and then combined to derive an average score. If you examine the performance of the 2009 Buccaneers defense, it paints an interesting (if painful) picture. Little to no improvement is predicted. Now the grading data and the yardage and point data are only loosely correlated. It can be inferred that if the defense performs well (meaning they grade out high), the result of the oppositions offensive effort will be well contained. That is not guaranteed. But as a couple of metrics, these two sources seem fairly solid. As a fan, it is good to see the defense playing well again. Do I think that this is a miraculous turn of affairs? No. Coach Morris was originally slated for this role and I cannot help but wonder what the team may have done with Coach Gruden at the helm. But those questions do nothing but frustrate as we will never know the true answers. The ownership made a decision to go young. 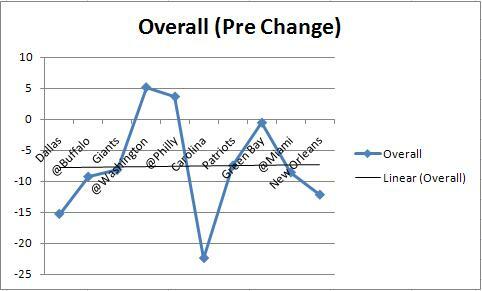 When an inexperienced coach is tapped and a rookie QB is drafted as part of the roadmap, the ride will be rough. It will certainly be bumpier than one year. Coach Morris’s support from the team itself is impressive (and I do not mean from a guy like Mike Clayton who is stealing money from the team right now). I believe what Coach Morris has done on the defensive side of the ball is impressive. I think that decision making has been (and continues to be) an issue. Two coordinators removed within a year and a promotion of one, who is, in my opinion, horrible (Greg Olson), does not bode well for next year. The hiring process better be examined. Next year will be critical for the Bucs. We walk into the draft with 10 picks and a chance to lay a foundation for the next 7 – 10 years. Do we stay the course with the young guy we gambled on or switch horses? I say we press it.